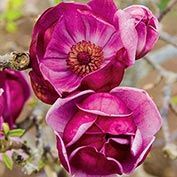 Genie Magnolia | Gurney's Seed & Nursery Co. Spectacular new introduction blooms heavily at a young age. 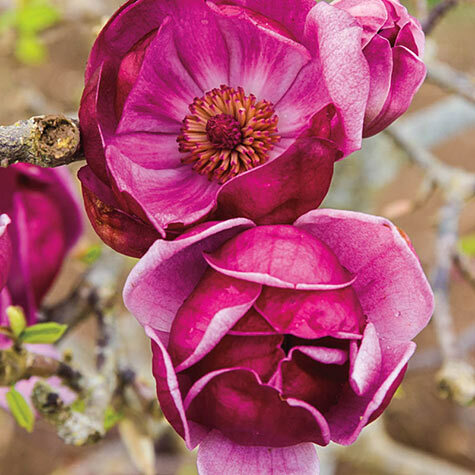 Deep plum-red flowers inside and out are a color breakthrough! Flower buds are a deep, dark red. Can rebloom in hot climates. 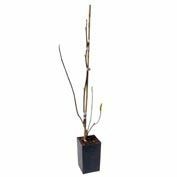 Deciduous, compact tree with dark green, healthy-looking foliage. 11–15' tall at maturity. Potted. Zones 6–9. Flower Form: Black-red, tulip-shaped flower buds unfurl slowly into rounded, goblet-shaped blooms with 6-12 tepals and a diameter of around 15 cm. Comments: Spectacular new introduction blooms heavily at a young age. Deep plum-red flowers inside and out are a color breakthrough! Flower buds are a deep, dark red. Can rebloom in hot climates. Deciduous, compact tree with dark green, healthy-looking foliage. 11-15' tall at maturity. Potted. Zones 6-9.